Destroyer Marijuana from Cannabiogen is a subtle strain bringing together the best sativas in the world that are predominantly Thai. It has the Guinness record of trichomes production. Destroyer is a 100% Sativa Cannabis. His ancestors are Meao Thai and a very stable and early Mexican/Colombian strain. This backcross between two of the best lineages of CBG has been very hard to do and its development has cost more than 7 years perfecting this hybrid. The total stabilization of the mother Thai has been practically impossible to do. Thus, and in order to complemente these features the introduction of another mother was demanded. This new mother was posteriorly adapted corresponding to a early and more productive Sativa. 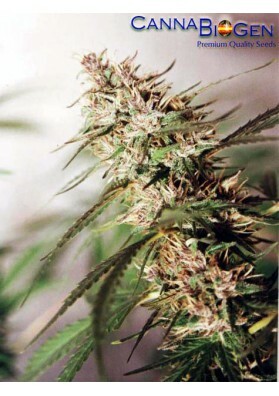 The result is a strain that meets the subtleties of the best predominantly Thai sativas in the world. The small but numerous floral branches are covered with large amounts of trichomes full of THC, producing 92 trichomes per mm2, which makes it a possible Guiness record. Destroyer produce floral aromas are and hints of of lavender. This strain has an uplifting, intensely psychoactive, clear and cerebral effect. It has a medium/high performance in outdoors being lower in indoors. This strain also works well applying SOG and SCROG techniques. Destroyer needs higher levels of light exposure than most other varieties requiring optimal conditions in indoors and a spot in full sun in outdoors..
Environmental conditions should be rather dry during the flowering period we recomend using low levels of nutrients, especially nitrogen. The flowering period is about 9 -12 weeks but is highly dependent on crop conditions. The vegetative period should at least of 30 days for high performances.